After many weeks of lengthy deliberations about the weather and angling prospects, we finally meet Mick early on a very cold January morning along the beach at Fleetwood, Lancashire. Today, the weather is acceptable – cloudy and somewhat windy. We’re hoping the gales will abate long enough for us, and other members of Mick’s sea fishing club, to tempt some whiting and big cod. A prime whiting from the Irish Sea displays its pinkish flank in the fading winter light. Mick is about to haul aboard two plump whiting, caught on thin strips of mackerel. Here are 14 of the many whiting Mick caught – not bad for a few short hours in winter. He looks pleased, even though a double-figure cod didn’t come his way this outing. If you find areas of rough ground – rocky outcrops, pinnacles or banks – you’re on your way to finding both cod and whiting, not to mention the odd bonus conger. This is true of both boat and shore angling. The innumerable crevices are home to crabs and shrimps while the structures themselves, rising off the featureless bottom, attract shoals of pouting, sprats and whiting. Mick threads two semi-thawed black lug up each size 1/0 Aberdeen hook then lobs the bait down and across the tide. 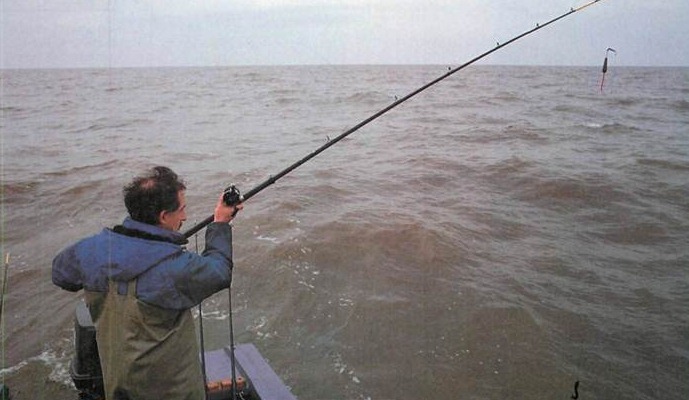 The rig swings around in the tide until the lead bites into the bottom and holds, tensing the line and arching the rod tip slightly. He retreats to the shelter of the canopy, out of the wintry January wind, and waits for that familiar knocking of the rod tips. There’s nothing complicated about this style of angling. Fishing the right bait (black lug) at the right place (rough ground) under the right conditions (dropping tide) is about all you can do. The rest is up to the fish. Mick sits back, takes a drink of hot coffee from his flask and gazes across the sea, his thoughts as far removed as Ireland. The knock, knock, knock of the rod, however, brings him quickly back. He picks up the rod and strikes. Kicking and screaming along the surface of the rough, dirty-coloured water comes a lone pout. 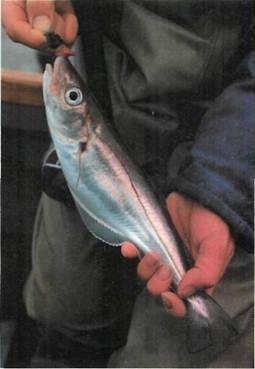 Soon the other rod does likewise, and a long, sleek 1lb (0.45kg) whiting lies at the bottom of the boat. An hour later several whiting have succumbed to Mick’s lug and mackerel baits. The only thing missing is a chunky cod; this would complete the picture nicely. But the rods continue to rattle away, producing whiting and the odd pout on worm. Mick attaches a Knotless Tackle wishbone rig, and puts a slice of mackerel on each hook. 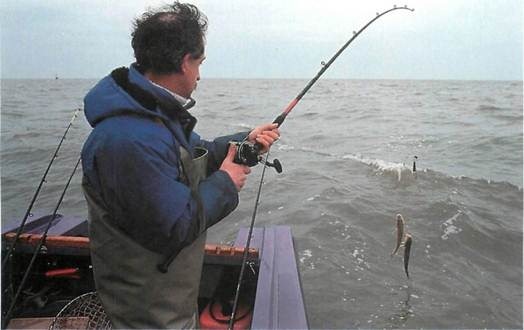 Normally after 15 minutes or so he would change the washed-out baits – but this isn’t a big problem today down among the hungry, bait-robbing whiting. He gently casts the rig away from the boat. (There’s no need to blast the bait a long way.) The wishbone rig allows you to use more bait, and you can bring in two fish instead of one. It’s also not as prone to tangle as a two- or three-hook paternoster. With a dozen or so nice 0.68kg whiting, Mick decides to move to another rough-ground mark a couple miles away. Chances are the whiting will be there — again in abundance — along with a few cod. To stay in one area all day isn’t a feasible strategy when you’re after cod — if you’ve fished a mark without any reward, move on. Mick picks up the anchor, and we motor off, facing the pounding waves yet again. This hardened angler has been out to sea so many times he’s oblivious to the waves. 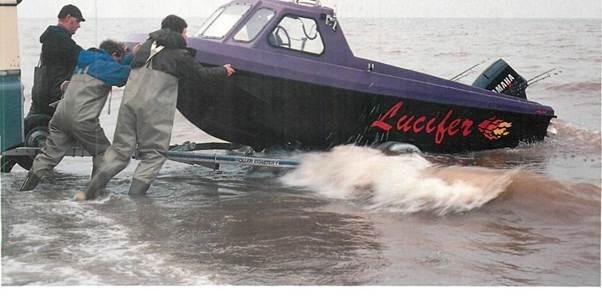 He drops the plug, and the boat swings around in the tide and wind. He casts out his rigs – both baited with black lug – and we wait. The light is fading fast. Radio conversations with his mates reveal that no other member of the club has a cod. And with the tide dropping, Mick decides to call it a day. So, with a large bag of fresh 0.45-0.68kg whiting stowed safely away in the bottom of the boat, we start the roller-coaster ride back to Fleetwood.